Over the last 6 months a number of McCloy Consulting staff have had the pleasure of being invited to guest lecturer at Queens University of Belfast. We felt that this was a fantastic opportunity to provide a practical industry insight for students as they start to refine career choices. This was coupled with providing them with expert knowledge and insight of the types of systems and processes that we specialise in. The talks were varied and also to a range of audiences. The feedback was very positive and below provides you with a snap shot of some of the areas that we covered. Caítríona Downey, one of our Graduate Consultants, gave an in-depth career talk to 2nd and 3rd year students from Geography, Environmental Management, Archaeology, and Civil Engineering backgrounds. 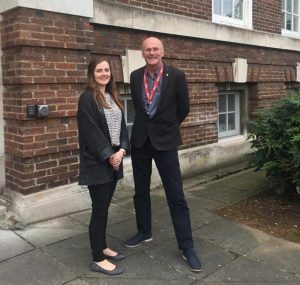 She focused on the practical uses of GIS in the workplace and employability, discussing how she uses GIS on a daily basis with relation to hydrological mapping, water quality, contaminated land and flood risk assessment. She also discussed types of employment available to graduates with a background in GIS and how these skills are used practically in the environmental industry. 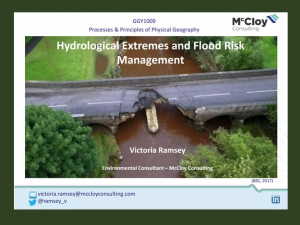 Victoria Ramsey, an experienced Environmental Consultant, provided a guest lecture in October on Hydrological Extremes and Flood Risk Management for 1st Year Geography students in the School of Natural and Built Environment as part of their Process and Principles of Physical Geography module. The lecture covered flood risk in NI, an introduction to flood estimation and flood modelling and the role of climate change on hydrology, all of which were showcased by case studies of project work. Our Director, Anthony McCloy, delivered a lecture to Civil and Environmental Engineering Master students taking the Hydrology and Hydrogeology module. 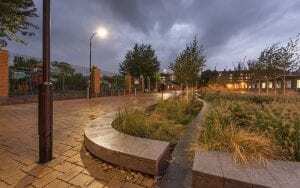 His lecture focused on SuDS and Flood Management he led the students through award winning case studies of Bridget Joyce Square and Sheffield Grey 2 Green to illustrate the use of SuDS in the urban environment. We would like to thank Queens University for the opportunity to provide these lectures and look forward to similar opportunities in the future.